The CBM910II is one of the smallest POS printers available. Fitting into the palm of your hand, this proven and reliable serial dot matrix printer is ideal for bankcard, POS and coin counting applications. Built for a long trouble-free life, with a MCBF of at least 1.5 million lines, the capability of bit image graphics printing and a memory switch, the CBM910II offers a versatile, cost effectiv »Ver mas The CBM910II is one of the smallest POS printers available. Fitting into the palm of your hand, this proven and reliable serial dot matrix printer is ideal for bankcard, POS and coin counting applications. Built for a long trouble-free life, with a MCBF of at least 1.5 million lines, the capability of bit image graphics printing and a memory switch, the CBM910II offers a versatile, cost effective and compact solution. CBM910II POS Printer (Serial Interface, 24 COL, 58mm, Ivory) The CBM910II is one of the smallest POS printers available. Fitting into the palm of your hand, this proven and reliable serial dot matrix printer is ideal for bankcard, POS and coin counting applications. Built for a long trouble-free life, with a MCBF of at least 1.5 million lines, the capability of bit image graphics printing and a memory switch, the CBM910II offers a versatile, cost effective and compact solution. CBM-920 Impact Printer (58mm, 2.5 LPS-40 Columns, Parallel Interface and Panel Mount) - Color: Ivory The CBM910II is one of the smallest POS printers available. Fitting into the palm of your hand, this proven and reliable serial dot matrix printer is ideal for bankcard, POS and coin counting applications. Built for a long trouble-free life, with a MCBF of at least 1.5 million lines, the capability of bit image graphics printing and a memory switch, the CBM910II offers a versatile, cost effective and compact solution. CBM910II POS Printer (Parallel Interface, 58 mm, 1.8 LPS - 40 Columns and Paper End Sensor) - Color: Ivory The CBM910II is one of the smallest POS printers available. Fitting into the palm of your hand, this proven and reliable serial dot matrix printer is ideal for bankcard, POS and coin counting applications. Built for a long trouble-free life, with a MCBF of at least 1.5 million lines, the capability of bit image graphics printing and a memory switch, the CBM910II offers a versatile, cost effective and compact solution. CBM-920 Impact Printer (58mm, 2.5 LPS-40 Columns, Serial Interface and Panel Mount) - Color: Cool White The CBM910II is one of the smallest POS printers available. Fitting into the palm of your hand, this proven and reliable serial dot matrix printer is ideal for bankcard, POS and coin counting applications. Built for a long trouble-free life, with a MCBF of at least 1.5 million lines, the capability of bit image graphics printing and a memory switch, the CBM910II offers a versatile, cost effective and compact solution. CBM910II POS Printer (Serial Interface and 40 Column, Ivory) The CBM910II is one of the smallest POS printers available. 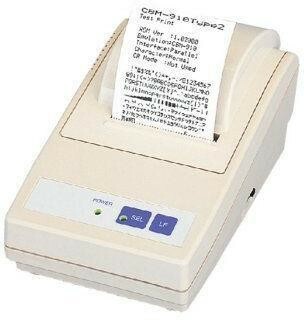 Fitting into the palm of your hand, this proven and reliable serial dot matrix printer is ideal for bankcard, POS and coin counting applications. Built for a long trouble-free life, with a MCBF of at least 1.5 million lines, the capability of bit image graphics printing and a memory switch, the CBM910II offers a versatile, cost effective and compact solution.